My name is Carol Hawkins. 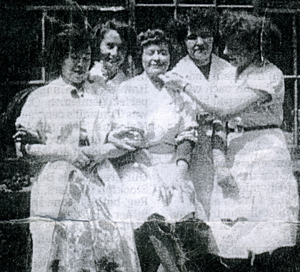 My mum Dolly Brown worked at Gladstone China for quite a few years in the 50s, together with her sisters Clare and Alison, and her cousin Thelma. They worked as cup handlers. This photograph was taken outside the factory. My mother is in the centre, and her workmates are on either side of her. The Sentinel newspaper printed a letter I wrote with this photo. My mum has since passed away at 88 years old. My Aunty has just turned 100. In fact she was 98 when the letter was published, not 89as it stated in the paper. I used to go to the potbank every day for lunch in the canteen as I attended a school nearby. I loved the place, the smell, the noise and the wonderful cheery atmosphere. I was only seven years old, and I have very happy memories of that time. My uncle Tom Brown owned a small china manufacturing business in Fenton, and my father Ken helped him run it. The ware was backstamped ‘Denbro’ – this was an abbreviation of my cousin’s name – Denise Brown. This was in the 1960s. I used to go to a Saturday market in Ashbourne, Derbyshire with my father, where he sold the dinner and tea sets. They were beautiful, and were bought by many American visitors to the area.